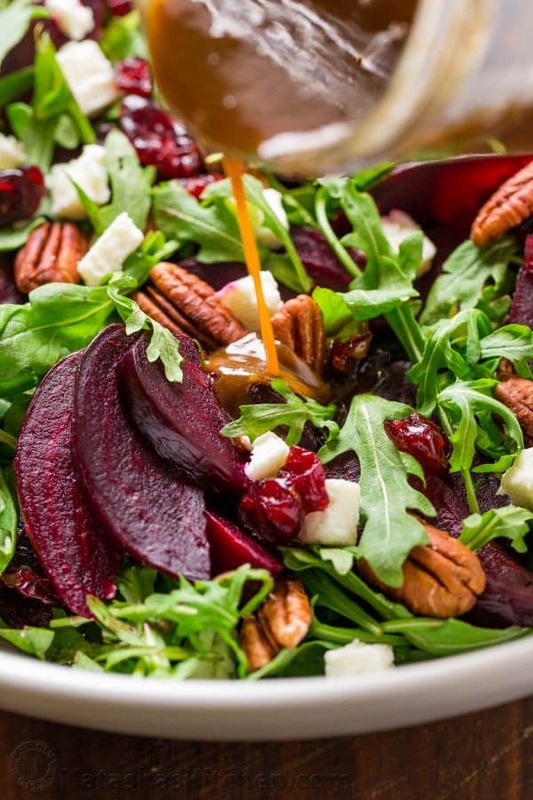 This beet salad with arugula tastes fancy but is SO EASY to make. 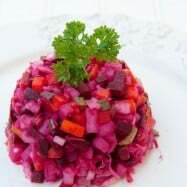 It reminds me of the beet salad at the Cheesecake Factory.This is a show-stopping and flavorful salad that is impressive for entertaining or a wonderful meal in. My friend Nataliya B shared the idea for this salad with me and it was an instant hit! We brought this to my sister’s house for dinner and it disappeared quickly with wonderful reviews from everyone. The balsamic vinaigrette will win you over. 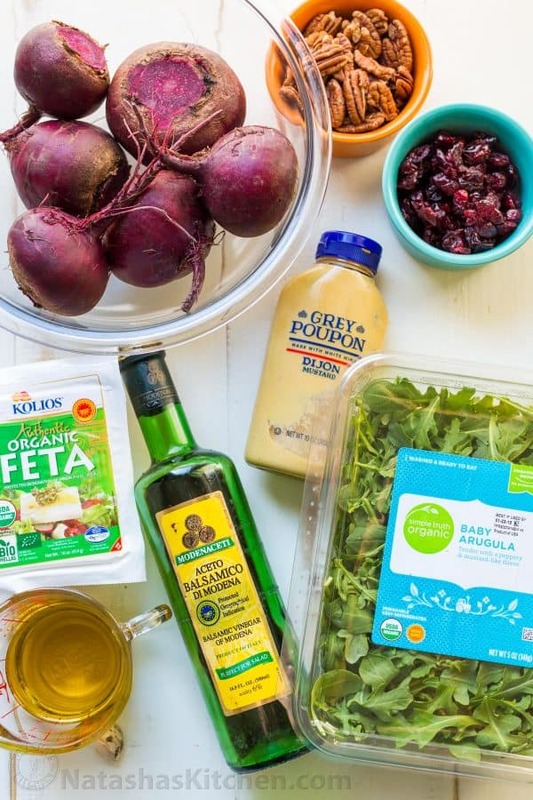 We use this same dressing on our chopped chicken salad and everywhere we can! Make-Ahead Tip: Yes, you can absolutely pre-cook the beets up to 3 days in advance, cover and refrigerate them until ready to use. And yes, you can make the beets in an Instant Pot!! P.S. We’ve included our Amazon affiliate links below for the tools we used to make this recipe. **We found the organic Feta in our local Boise Costco. It comes in a block so we diced it up and we loved the hearty bites of feta here. 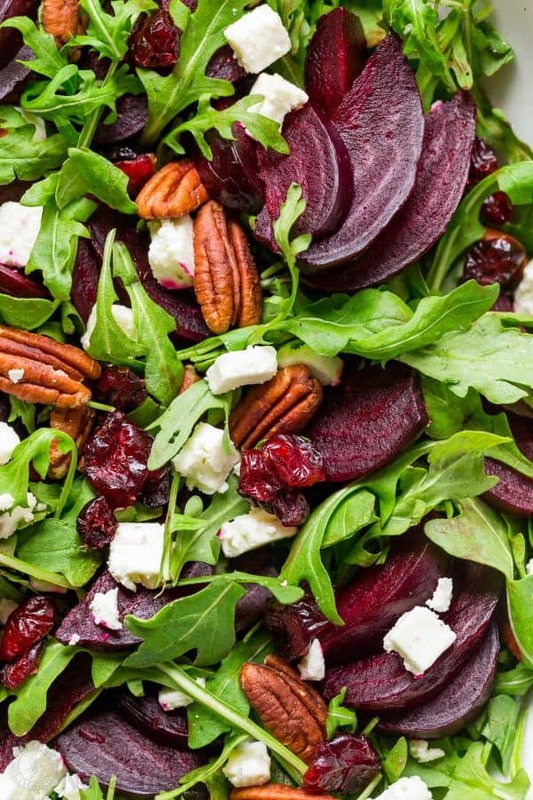 Everything about this beet salad is good – rich in flavor and super healthy. 1. Wash and trim the beets so that the stems are about ½-inch long and the roots are no more than about 2 inches long. 2. Place basket insert into instant pot and add 1 cup water. Arrange the beets in a single layer over the insert. 4. When the beets are finished cooking, immediately release the pressure by turning the venting knob to venting position. Unlock the lid. Use a sharp knife to poke the beets. If the knife pierces the flesh without too much resistance, they’re done. If the beets still seem a little too hard, cook them under high pressure for 2 to 5 more minutes. 1. If you don’t have an instant pot yet: Preheat the oven to 400˚F. Line the bottom of a medium rimmed baking sheet with foil. 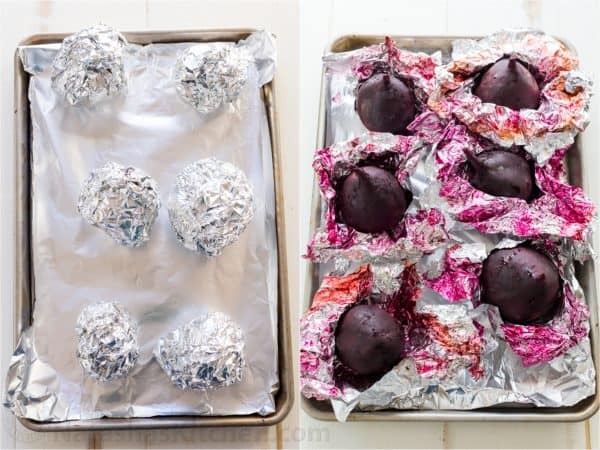 Wrap each beat in a sheet of foil, wrapping tightly to seal and arrange the beets on the lined baking sheet. 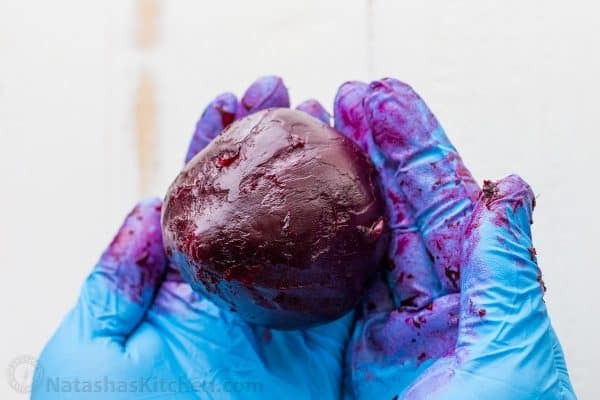 Bake in a preheated oven for 1 hour or until largest beet is easily pierced. Remove from oven, unwrap and allow them to cool to room temperature then peel the skins (see Pro Tip Below) and slice into halves and then wedges. Pro Tip: Peeling cooked beets is easy with a pair of gloves to keep your hands clean. They peel right off. I also slice off the root end to discard any part of the beet that was touching foil. 2. Toast 1/2 cup pecans on a dry skillet, tossing frequently until golden and fragrant. Remove from heat and cool to room temperature. 3. 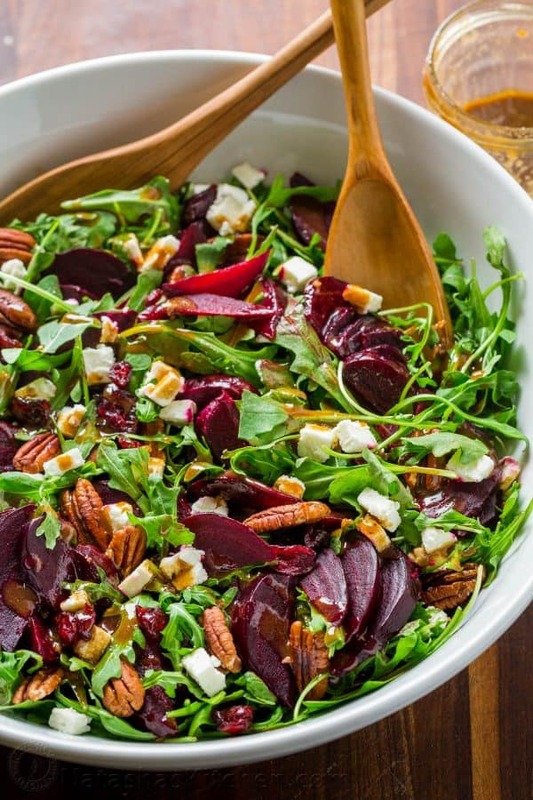 Transfer the arugula to a large mixing bowl then add remaining salad ingredients: sliced beets, 1/2 cup feta cheese, 1/2 cup toasted pecans and 1/2 cup dried cranberries. 1. 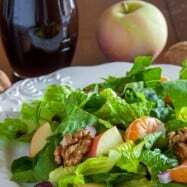 In a mason jar, combine all dressing ingredients (1/2 cup extra virgin olive oil, 3 Tbsp balsamic vinegar, 1 Tbsp dijon mustard, 1 pressed garlic clove, 1/4 tsp salt and 1/8 tsp pepper) and shake well to combine and add to the salad to taste. If not serving salad right away, shake the dressing again just before drizzling over the salad. I usually have a bit of salad dressing left over (about 1/4) with this salad (which is reflected in the nutrition label). Leftover dressing is a good problem to have! This beet salad tastes fancy but is SO EASY to make. 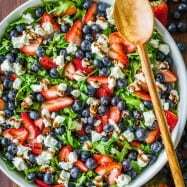 This is a show-stopping and flavorful salad that is impressive for entertaining or a wonderful meal in. Make-ahead tip: pre-cook beets up to 3 days in advance, cover and refrigerate them until ready to use. Preheat the oven to 400˚F. Line the bottom of a medium rimmed baking sheet with foil. Wrap each beat tightly in a sheet of foil and arrange lined baking sheet. Bake in preheated oven for 1 hour or until largest beet is easily pierced. Unwrap beets and cool to room temperature then peel the skins (see Pro Tip Below*) and slice into halves and then wedges. Toast 1/2 cup pecans on a dry skillet, tossing frequently until golden and fragrant. Remove from heat and let cool. Transfer arugula to a large mixing bowl then add remaining salad ingredients: sliced beets, feta cheese, toasted pecans and dried cranberries. 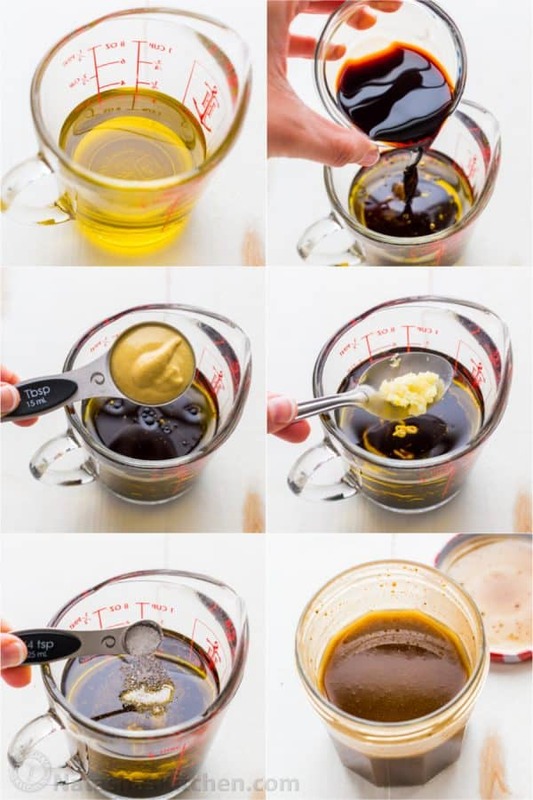 In a small mason jar, combine all dressing ingredients and shake well to combine. Drizzle over salad to taste. If not serving salad right away, shake the dressing again just before drizzling over salad. *Pro Tip: Use disposable gloves to keep your hands clean. Rub the beet and the skins will come right off. Slice off the root end to discard all part of the beet that touched foil. 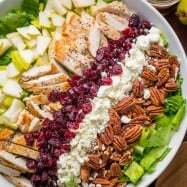 So much amazing flavor – This makes for an excellent party salad – a keeper for sure! Are you convinced yet? 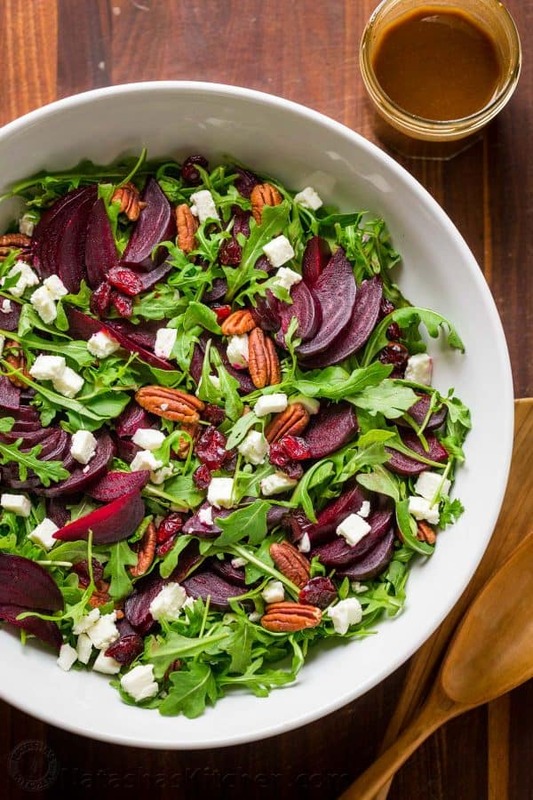 Now go forth and make this beet and arugula salad then let me know how much you loved it :). Do the beets need to be poked by a fork before placing in the oven? (Like potatoes) I have never cooked beets in the oven before. 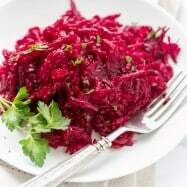 Can I use canned beets to make it a step easier? 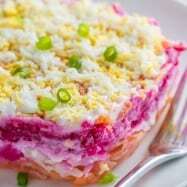 Yesterday I tried this with the Beef Plov that you did it! My family eat soo much!!! Natasha, your pictures are stunning. This recipe is easy to make. And the most important:HEALTHY!